There was a sighting in a nearby garden on Sunday, 22 November, and then he was caught bright and early on Monday morning. He was cold, tired and hungry but otherwise seems OK. We are very pleased to have him home after more than a month. Thank you everyone who shared Fred and made him recognisable. Your help is greatly appreciated. Fred is a ginger & white male domestic short hair. 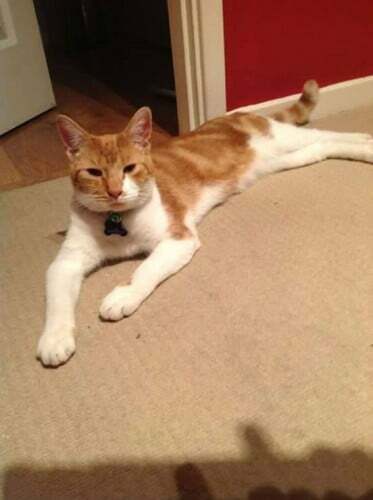 He was last seen on 18 October in Wordsley. He may be trying to find his way to our previous home at Amblecote. Please check your sheds and outbuildings. If you see Fred please contact us urgently via the Contact Form on this page. Please share Fred’s page to your social media accounts, thanks.